On a May afternoon in 1943, an Army Air Forces bomber crashed into the Pacific Ocean and disappeared, leaving only a spray of debris and a slick of oil, gasoline, and blood. Then, on the ocean surface, a face appeared. It was that of a young lieutenant, the plane’s bombardier, who was struggling to a life raft and pulling himself aboard. So began one of the most extraordinary odysseys of the Second World War. The lieutenant’s name was Louis Zamperini. In boyhood, he’d been a cunning and incorrigible delinquent, breaking into houses, brawling, and fleeing his home to ride the rails. As a teenager, he had channeled his defiance into running, discovering a prodigious talent that had carried him to the Berlin Olympics and within sight of the four-minute mile. But when war had come, the athlete had become an airman, embarking on a journey that led to his doomed flight, a tiny raft, and a drift into the unknown. Ahead of Zamperini lay thousands of miles of open ocean, leaping sharks, a foundering raft, thirst and starvation, enemy aircraft, and, beyond, a trial even greater. Driven to the limits of endurance, Zamperini would answer desperation with ingenuity; suffering with hope, resolve, and humor; brutality with rebellion. His fate, whether triumph or tragedy, would be suspended on the fraying wire of his will. In her long-awaited new book, Laura Hillenbrand writes with the same rich and vivid narrative voice she displayed in "Seabiscuit". Telling an unforgettable story of a man’s journey into extremity, "Unbroken" is a testament to the resilience of the human mind, body, and spirit. 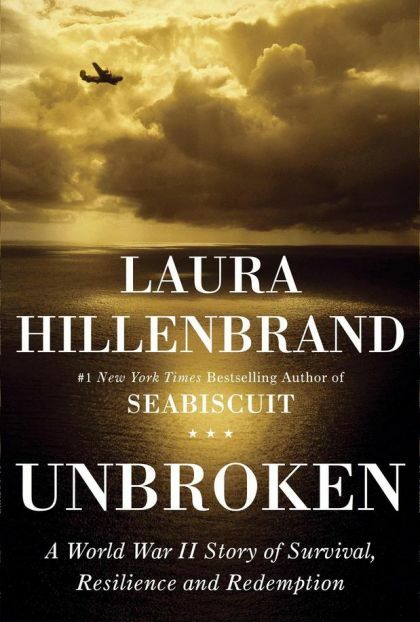 Laura Hillenbrand is the author of the critically acclaimed ''Seabiscuit: An American Legend'', which spent 42 weeks at #1 on the New York Times bestseller list, in hardcover and paperback. 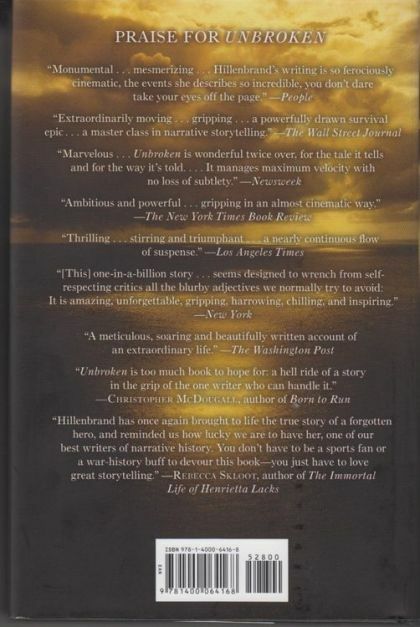 ''Seabiscuit'' was finalist for the National Book Critics Circle Award and the Los Angeles Times Book Prize, won the Book Sense Nonfiction Book of the Year Award and the William Hill Sports Book of the Year Award, landed on more than fifteen best-of-the-year lists, and inspired the film ''Seabiscuit''. Laura is a two-time winner of the Eclipse Award, the highest journalistic honor in thoroughbred racing. She and actor Gary Sinise are the co-founders of Operation International Children (www.operationinternationalchildren.org), a charity that provides school supplies to needy children through American troops. She lives in Washington, D.C.